Polycyclic aromatic hydrocarbons (PAHs, also polyaromatic hydrocarbons or polynuclear aromatic hydrocarbons) are hydrocarbons—organic compounds containing only carbon and hydrogen—that are composed of multiple aromatic rings (organic rings in which the electrons are delocalized). The simplest such chemicals are naphthalene, having two aromatic rings, and the three-ring compounds anthracene and phenanthrene. PAHs are uncharged, non-polar molecules found in coal and in tar deposits. They are also produced by the thermal decomposition of organic matter (for example, in engines and incinerators or when biomass burns in forest fires). PAHs are abundant in the universe, and have recently been found to have formed possibly as early as the first couple of billion years after the Big Bang, in association with formation of new stars and exoplanets. Some studies suggest that PAHs account for a significant percentage of all carbon in the universe. Polycyclic aromatic hydrocarbons are discussed as possible starting materials for abiotic syntheses of materials required by the earliest forms of life. By definition, polycyclic aromatic hydrocarbons have multiple cycles, precluding benzene from being considered a PAH. Naphthalene is considered the simplest polycyclic aromatic hydrocarbon by the US EPA and US CDC for policy contexts. Other authors consider PAHs to start with the tricyclic species phenanthrene and anthracene. PAHs are not generally considered to contain heteroatoms or carry substituents. PAHs are nonpolar and lipophilic. Larger PAHs are generally insoluble in water, although some smaller PAHs are soluble and known contaminants in drinking water. The larger members are also poorly soluble in organic solvents and in lipids. They are usually colorless. The aromaticity varies for PAHs. According to Clar's rule, the resonance structure of a PAH that has the largest number of disjoint aromatic pi sextets—i.e. benzene-like moieties—is the most important for the characterization of the properties of that PAH. For example, in phenanthrene one Clar structure has two sextets—the first and third rings—while the other resonance structure has just one central sextet; therefore in this molecule the outer rings have greater aromatic character whereas the central ring is less aromatic and therefore more reactive. In contrast, in anthracene the resonance structures have one sextet each, which can be at any of the three rings, and the aromaticity spreads out more evenly across the whole molecule. This difference in number of sextets is reflected in the differing ultraviolet–visible spectra of these two isomers, as higher Clar pi-sextets are associated with larger HOMO-LUMO gaps; the highest-wavelength absorbance of phenanthrene is at 293 nm, while anthracene is at 374 nm. Three Clar structures with two sextets each are present in the four-ring chrysene structure: one having sextets in the first and third rings, one in the second and fourth rings, and one in the first and fourth rings. Superposition of these structures reveals that the aromaticity in the outer rings is greater (each has a sextet in two of the three Clar structures) compared to the inner rings (each has a sextet in only one of the three). Polycyclic aromatic compounds characteristically reduce to the radical anions. The redox potential correlates with the size of the PAH. Polycyclic aromatic hydrocarbons are primarily found in natural sources such as creosote. They can result from the incomplete combustion of organic matter. PAHs can also be produced geologically when organic sediments are chemically transformed into fossil fuels such as oil and coal. PAHs are considered ubiquitous in the environment and can be formed from either natural or manmade combustion sources. The dominant sources of PAHs in the environment are thus from human activity: wood-burning and combustion of other biofuels such as dung or crop residues contribute more than half of annual global PAH emissions, particularly due to biofuel use in India and China. As of 2004, industrial processes and the extraction and use of fossil fuels made up slightly more than one quarter of global PAH emissions, dominating outputs in industrial countries such as the United States. Wildfires are another notable source. Substantially higher outdoor air, soil, and water concentrations of PAHs have been measured in Asia, Africa, and Latin America than in Europe, Australia, the U.S., and Canada. PAHs are typically found as complex mixtures. Lower-temperature combustion, such as tobacco smoking or wood-burning, tends to generate low molecular weight PAHs, whereas high-temperature industrial processes typically generate PAHs with higher molecular weights. Most PAHs are insoluble in water, which limits their mobility in the environment, although PAHs sorb to fine-grained organic-rich sediments. Aqueous solubility of PAHs decreases approximately logarithmically as molecular mass increases. Two-ringed PAHs, and to a lesser extent three-ringed PAHs, dissolve in water, making them more available for biological uptake and degradation. Further, two- to four-ringed PAHs volatilize sufficiently to appear in the atmosphere predominantly in gaseous form, although the physical state of four-ring PAHs can depend on temperature. In contrast, compounds with five or more rings have low solubility in water and low volatility; they are therefore predominantly in solid state, bound to particulate air pollution, soils, or sediments. In solid state, these compounds are less accessible for biological uptake or degradation, increasing their persistence in the environment. Spiral galaxy NGC 5529 has been found to have amounts of PAHs. Human exposure varies across the globe and depends on factors such as smoking rates, fuel types in cooking, and pollution controls on power plants, industrial processes, and vehicles. Developed countries with stricter air and water pollution controls, cleaner sources of cooking (i.e., gas and electricity vs. coal or biofuels), and prohibitions of public smoking tend to have lower levels of PAH exposure, while developing and undeveloped countries tend to have higher levels. A wood-burning open-air cooking stove. Smoke from solid fuels like wood is a large source of PAHs globally. Burning solid fuels such as coal and biofuels in the home for cooking and heating is a dominant global source of PAH emissions that in developing countries leads to high levels of exposure to indoor particulate air pollution containing PAHs, particularly for women and children who spend more time in the home or cooking. In industrial countries, people who smoke tobacco products, or who are exposed to second-hand smoke, are among the most highly exposed groups; tobacco smoke contributes to 90% of indoor PAH levels in the homes of smokers. For the general population in developed countries, the diet is otherwise the dominant source of PAH exposure, particularly from smoking or grilling meat or consuming PAHs deposited on plant foods, especially broad-leafed vegetables, during growth. PAHs are typically at low concentrations in drinking water. 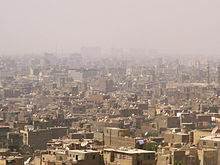 Smog in Cairo. Particulate air pollution, including smog, is a substantial cause of human exposure to PAHs. Emissions from vehicles such as cars and trucks can be a substantial outdoor source of PAHs in particulate air pollution. Geographically, major roadways are thus sources of PAHs, which may distribute in the atmosphere or deposit nearby. Catalytic converters are estimated to reduce PAH emissions from gasoline-fired vehicles by 25-fold. People can also be occupationally exposed during work that involves fossil fuels or their derivatives, wood burning, carbon electrodes, or exposure to diesel exhaust. Industrial activity that can produce and distribute PAHs includes aluminum, iron, and steel manufacturing; coal gasification, tar distillation, shale oil extraction; production of coke, creosote, carbon black, and calcium carbide; road paving and asphalt manufacturing; rubber tire production; manufacturing or use of metal working fluids; and activity of coal or natural gas power stations. Crude oil on a beach after a 2007 oil spill in Korea. PAHs typically disperse from urban and suburban non-point sources through road run-off, sewage, and atmospheric circulation and subsequent deposition of particulate air pollution. Soil and river sediment near industrial sites such as creosote manufacturing facilities can be highly contaminated with PAHs. Oil spills, creosote, coal mining dust, and other fossil fuel sources can also distribute PAHs in the environment. Two- and three-ringed PAHs can disperse widely while dissolved in water or as gases in the atmosphere, while PAHs with higher molecular weights can disperse locally or regionally adhered to particulate matter that is suspended in air or water until the particles land or settle out of the water column. PAHs have a strong affinity for organic carbon, and thus highly organic sediments in rivers, lakes, and the ocean can be a substantial sink for PAHs. Algae and some invertebrates such as protozoans, mollusks, and many polychaetes have limited ability to metabolize PAHs and bioaccumulate disproportionate concentrations of PAHs in their tissues; however, PAH metabolism can vary substantially across invertebrate species. Most vertebrates metabolize and excrete PAHs relatively rapidly. Tissue concentrations of PAHs do not increase (biomagnify) from the lowest to highest levels of food chains. PAHs transform slowly to a wide range of degradation products. Biological degradation by microbes is a dominant form of PAH transformation in the environment. Soil-consuming invertebrates such as earthworms speed PAH degradation, either through direct metabolism or by improving the conditions for microbial transformations. Abiotic degradation in the atmosphere and the top layers of surface waters can produce nitrogenated, halogenated, hydroxylated, and oxygenated PAHs; some of these compounds can be more toxic, water-soluble, and mobile than their parent PAHs. The British Geological Survey reported the amount and distribution of PAH compounds including parent and alkylated forms in urban soils at 76 locations in Greater London. The study showed that parent (16 PAH) content ranged from 4 to 67 mg/kg (dry soil weight) and an average PAH concentration of 18 mg/kg (dry soil weight) whereas the total PAH content (33 PAH) ranged from 6 to 88 mg/kg and fluoranthene and pyrene were generally the most abundant PAHs. Benzo[a]pyrene (BaP), the most toxic of the parent PAHs, is widely considered a key marker PAH for environmental assessments; the normal background concentration of BaP in the London urban sites was 6.9 mg/kg (dry soil weight). London soils contained more stable four- to six-ringed PAHs which were indicative of combustion and pyrolytic sources, such as coal and oil burning and traffic-sourced particulates. However, the overall distribution also suggested that the PAHs in London soils had undergone weathering and been modified by a variety of pre-and post-depositional processes such as volatilization and microbial biodegradation. Managed burning of moorland vegetation in the UK has been shown to generate PAHs which become incorporated into the peat surface. Burning of moorland vegetation such as heather initially generates high amounts of two- and three-ringed PAHs relative to four- to six-ringed PAHs in surface sediments, however, this pattern is reversed as the lower molecular weight PAHs are attenuated by biotic decay and photodegradation. Evaluation of the PAH distributions using statistical methods such as principal component analyses (PCA) enabled the study to link the source (burnt moorland) to pathway (suspended stream sediment) to the depositional sink (reservoir bed). Concentrations of PAHs in river and estuarine sediments vary according to a variety of factors including proximity to municipal and industrial discharge points, wind direction and distance from major urban roadways, as well as tidal regime which controls the diluting effect of generally cleaner marine sediments relative to freshwater discharge. Consequently, the concentrations of pollutants in estuaries tends to decrease at the river mouth. Understanding of sediment hosted PAHs in estuaries is important for the protection of commercial fisheries (such as mussels) and general environmental habitat conservation because PAHs can impact the health of suspension and sediment feeding organism. River-estuary surface sediments in the UK tend to have a lower PAH content than sediments buried 10–60 cm from the surface reflecting lower present day industrial activity combined with improvement in environmental legislation of PAH. Typical PAH concentrations in UK estuaries range from about 19 to 16,163 µg/kg (dry sediment weight) in the River Clyde and 626 to 3,766 µg/kg in the River Mersey. In general estuarine sediments with a higher natural total organic carbon content (TOC) tend to accumulate PAHs due to high sorption capacity of organic matter. A similar correspondence between PAHs and TOC has also been observed in the sediments of tropical mangroves located on the coast of southern China. Volcanic eruptions may emit PAHs. Certain PAHs such as perylene can also be generated in anaerobic sediments from existing organic material, although it remains undetermined whether abiotic or microbial processes drive their production. Cancer is a primary human health risk of exposure to PAHs. Exposure to PAHs has also been linked with cardiovascular disease and poor fetal development. PAHs have been linked to skin, lung, bladder, liver, and stomach cancers in well-established animal model studies. Specific compounds classified by various agencies as possible or probable human carcinogens are identified in the section "Regulation and Oversight" below. An 18th-century drawing of chimney sweeps. Historically, PAHs contributed substantially to our understanding of adverse health effects from exposures to environmental contaminants, including chemical carcinogenesis. In 1775, Percivall Pott, a surgeon at St. Bartholomew’s Hospital in London, observed that scrotal cancer was unusually common in chimney sweepers and proposed the cause as occupational exposure to soot. A century later, Richard von Volkmann reported increased skin cancers in workers of the coal tar industry of Germany, and by the early 1900s increased rates of cancer from exposure to soot and coal tar was widely accepted. In 1915, Yamigawa and Ichicawa were the first to experimentally produce cancers, specifically of the skin, by topically applying coal tar to rabbit ears. In 1922, Ernest Kennaway determined that the carcinogenic component of coal tar mixtures was an organic compound consisting of only carbon and hydrogen. This component was later linked to a characteristic fluorescent pattern that was similar but not identical to benz[a]anthracene, a PAH that was subsequently demonstrated to cause tumors. Cook, Hewett and Hieger then linked the specific spectroscopic fluorescent profile of benzo[a]pyrene to that of the carcinogenic component of coal tar, the first time that a specific compound from an environmental mixture (coal tar) was demonstrated to be carcinogenic. In the 1930s and later, epidemiologists from Japan, the UK, and the US, including Richard Doll and various others, reported greater rates of death from lung cancer following occupational exposure to PAH-rich environments among workers in coke ovens and coal carbonization and gasification processes. An adduct formed between a DNA strand and an epoxide derived from a benzo[a]pyrene molecule (center); such adducts may interfere with normal DNA replication. The structure of a PAH influences whether and how the individual compound is carcinogenic. Some carcinogenic PAHs are genotoxic and induce mutations that initiate cancer; others are not genotoxic and instead affect cancer promotion or progression. PAHs that affect cancer initiation are typically first chemically modified by enzymes into metabolites that react with DNA, leading to mutations. When the DNA sequence is altered in genes that regulate cell replication, cancer can result. Mutagenic PAHs, such as benzo[a]pyrene, usually have four or more aromatic rings as well as a "bay region", a structural pocket that increases reactivity of the molecule to the metabolizing enzymes. Mutagenic metabolites of PAHs include diol epoxides, quinones, and radical PAH cations. These metabolites can bind to DNA at specific sites, forming bulky complexes called DNA adducts that can be stable or unstable. Stable adducts may lead to DNA replication errors, while unstable adducts react with the DNA strand, removing a purine base (either adenine or guanine). Such mutations, if they are not repaired, can transform genes encoding for normal cell signaling proteins into cancer-causing oncogenes. Quinones can also repeatedly generate reactive oxygen species that may independently damage DNA. Enzymes in the cytochrome family (CYP1A1, CYP1A2, CYP1B1) metabolize PAHs to diol epoxides. PAH exposure can increase production of the cytochrome enzymes, allowing the enzymes to convert PAHs into mutagenic diol epoxides at greater rates. In this pathway, PAH molecules bind to the aryl hydrocarbon receptor (AhR) and activate it as a transcription factor that increases production of the cytochrome enzymes. The activity of these enzymes may at times conversely protect against PAH toxicity, which is not yet well understood. Low molecular weight PAHs, with two to four aromatic hydrocarbon rings, are more potent as co-carcinogens during the promotional stage of cancer. In this stage, an initiated cell (a cell that has retained a carcinogenic mutation in a key gene related to cell replication) is removed from growth-suppressing signals from its neighboring cells and begins to clonally replicate. Low-molecular-weight PAHs that have bay or bay-like regions can dysregulate gap junction channels, interfering with intercellular communication, and also affect mitogen-activated protein kinases that activate transcription factors involved in cell proliferation. Closure of gap junction protein channels is a normal precursor to cell division. Excessive closure of these channels after exposure to PAHs results in removing a cell from the normal growth-regulating signals imposed by its local community of cells, thus allowing initiated cancerous cells to replicate. These PAHs do not need to be enzymatically metabolized first. Low molecular weight PAHs are prevalent in the environment, thus posing a significant risk to human health at the promotional phases of cancer. Adult exposure to PAHs has been linked to cardiovascular disease. PAHs are among the complex suite of contaminants in tobacco smoke and particulate air pollution and may contribute to cardiovascular disease resulting from such exposures. In laboratory experiments, animals exposed to certain PAHs have shown increased development of plaques (atherogenesis) within arteries. Potential mechanisms for the pathogenesis and development of atherosclerotic plaques may be similar to the mechanisms involved in the carcinogenic and mutagenic properties of PAHs. A leading hypothesis is that PAHs may activate the cytochrome enzyme CYP1B1 in vascular smooth muscle cells. This enzyme then metabolically processes the PAHs to quinone metabolites that bind to DNA in reactive adducts that remove purine bases. The resulting mutations may contribute to unregulated growth of vascular smooth muscle cells or to their migration to the inside of the artery, which are steps in plaque formation. These quinone metabolites also generate reactive oxygen species that may alter the activity of genes that affect plaque formation. Oxidative stress following PAH exposure could also result in cardiovascular disease by causing inflammation, which has been recognized as an important factor in the development of atherosclerosis and cardiovascular disease. Biomarkers of exposure to PAHs in humans have been associated with inflammatory biomarkers that are recognized as important predictors of cardiovascular disease, suggesting that oxidative stress resulting from exposure to PAHs may be a mechanism of cardiovascular disease in humans. Multiple epidemiological studies of people living in Europe, the United States, and China have linked in utero exposure to PAHs, through air pollution or parental occupational exposure, with poor fetal growth, reduced immune function, and poorer neurological development, including lower IQ. Some governmental bodies, including the European Union as well as NIOSH and the Environmental Protection Agency (EPA) in the US, regulate concentrations of PAHs in air, water, and soil. The European Commission has restricted concentrations of 8 carcinogenic PAHs in consumer products that contact the skin or mouth. A Considered probable or possible human carcinogens by the US EPA, the European Union, and/or the International Agency for Research on Cancer (IARC). A spectral database exists for tracking polycyclic aromatic hydrocarbons (PAHs) in the universe. Detection of PAHs in materials is often done using gas chromatography-mass spectrometry or liquid chromatography with ultraviolet-visible or fluorescence spectroscopic methods or by using rapid test PAH indicator strips. PAHs possess very characteristic UV absorbance spectra. 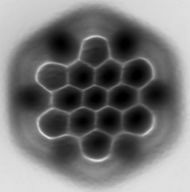 These often possess many absorbance bands and are unique for each ring structure. Thus, for a set of isomers, each isomer has a different UV absorbance spectrum than the others. This is particularly useful in the identification of PAHs. Most PAHs are also fluorescent, emitting characteristic wavelengths of light when they are excited (when the molecules absorb light). The extended pi-electron electronic structures of PAHs lead to these spectra, as well as to certain large PAHs also exhibiting semi-conducting and other behaviors. The Cat's Paw Nebula lies inside the Milky Way Galaxy and is located in the constellation Scorpius. Green areas show regions where radiation from hot stars collided with large molecules and small dust grains called "polycyclic aromatic hydrocarbons" (PAHs), causing them to fluoresce. PAHs may be abundant in the universe. They seem to have been formed as early as a couple of billion years after the Big Bang, and are associated with new stars and exoplanets. More than 20% of the carbon in the universe may be associated with PAHs. PAHs are considered possible starting material for the earliest forms of life. Light emitted by the Red Rectangle nebula and found spectral signatures that suggest the presence of anthracene and pyrene. This report was considered a controversial hypothesis that as nebulae of the same type as the Red Rectangle approach the ends of their lives, convection currents cause carbon and hydrogen in the nebulae's cores to get caught in stellar winds, and radiate outward. As they cool, the atoms supposedly bond to each other in various ways and eventually form particles of a million or more atoms. Adolf Witt and his team inferred that PAHs—which may have been vital in the formation of early life on Earth—can only originate in nebulae. Two extremely bright stars illuminate a mist of PAHs in this Spitzer image. More recently, fullerenes (or "buckyballs"), have been detected in other nebulae. Fullerenes are also implicated in the origin of life; according to astronomer Letizia Stanghellini, "It's possible that buckyballs from outer space provided seeds for life on Earth." In September 2012, NASA scientists reported results of analog studies in vitro that PAHs, subjected to interstellar medium (ISM) conditions, are transformed, through hydrogenation, oxygenation, and hydroxylation, to more complex organics—"a step along the path toward amino acids and nucleotides, the raw materials of proteins and DNA, respectively". Further, as a result of these transformations, the PAHs lose their spectroscopic signature which could be one of the reasons "for the lack of PAH detection in interstellar ice grains, particularly the outer regions of cold, dense clouds or the upper molecular layers of protoplanetary disks." NASA's Spitzer Space Telescope includes instruments for obtaining both images and spectra of light emitted by PAHs associated with star formation. These images can trace the surface of star-forming clouds in our own galaxy or identify star forming galaxies in the distant universe. In June 2013, PAHs were detected in the upper atmosphere of Titan, the largest moon of the planet Saturn. In October 2018, researchers reported low-temperature chemical pathways from simple organic compounds to complex PAHs. Such chemical pathways may help explain the presence of PAHs in the low-temperature atmosphere of Saturn's moon Titan, and may be significant pathways, in terms of the PAH world hypothesis, in producing presursors to biochemicals related to life as we know it. ^ a b ATSDR, Environmental Medicine; Environmental Health Education (2011-07-01). "Toxicity of Polycyclic Aromatic Hydrocarbons (PAHs): Health Effects Associated With PAH Exposure". Retrieved 2016-02-01. ^ a b c d e Hoover, R. (2014-02-21). "Need to Track Organic Nano-Particles Across the Universe? NASA's Got an App for That". NASA. Retrieved 2014-02-22. ^ a b c Allamandola, Louis; et al. (2011-04-13). "Cosmic Distribution of Chemical Complexity". NASA. Archived from the original on 2014-02-27. Retrieved 2014-03-03. ^ "Naphthalene is a PAH that is produced commercially in the US"
^ Fetzer, J. C. (2000). The Chemistry and Analysis of the Large Polycyclic Aromatic Hydrocarbons. Polycyclic Aromatic Compounds. 27. New York. pp. 143–162. doi:10.1080/10406630701268255. ISBN 978-0-471-36354-5. ^ Harvey, R. G. (1998). "Environmental Chemistry of PAHs". PAHs and Related Compounds: Chemistry. The Handbook of Environmental Chemistry. Springer. pp. 1–54. ISBN 9783540496977. ^ Feng, Xinliang; Pisula, Wojciech; Müllen, Klaus (2009). "Large polycyclic aromatic hydrocarbons: Synthesis and discotic organization". Pure and Applied Chemistry. 81 (2): 2203–2224. doi:10.1351/PAC-CON-09-07-07. ^ Clar, E. (1964). Polycyclic Hydrocarbons. New York, NY: Academic Press. LCCN 63012392. ^ Portella, G.; Poater, J.; Solà, M. (2005). "Assessment of Clar's aromatic π-sextet rule by means of PDI, NICS and HOMA indicators of local aromaticity". Journal of Physical Organic Chemistry. 18 (8): 785–791. doi:10.1002/poc.938. ^ Chen, T.-A. ; Liu, R.-S. (2011). "Synthesis of Polyaromatic Hydrocarbons from Bis(biaryl)diynes: Large PAHs with Low Clar Sextets". Chemistry: A European Journal. 17 (21): 8023–8027. doi:10.1002/chem.201101057. PMID 21656594. ^ Stevenson, Philip E. (1964). "The ultraviolet spectra of aromatic hydrocarbons: Predicting substitution and isomerism changes". Journal of Chemical Education. 41 (5): 234–239. Bibcode:1964JChEd..41..234S. doi:10.1021/ed041p234. ^ Ruoff, R. S.; Kadish, K. M.; Boulas, P.; Chen, E. C. M. (1995). "Relationship between the Electron Affinities and Half-Wave Reduction Potentials of Fullerenes, Aromatic Hydrocarbons, and Metal Complexes". The Journal of Physical Chemistry. 99 (21): 8843–8850. doi:10.1021/j100021a060. ^ Rieke, Reuben D.; Wu, Tse-Chong; Rieke, Loretta I. (1995). "Highly Reactive Calcium for the Preparation of Organocalcium Reagents: 1-Adamantyl Calcium Halides and Their Addition to Ketones: 1-(1-Adamantyl)cyclohexanol". Organic Syntheses. 72: 147. doi:10.15227/orgsyn.072.0147. ^ "QRPOIL:: | Bitumen | Bitumen". www.qrpoil.com. Retrieved 2018-07-19. ^ a b c d e f g h i j k Ravindra, K.; Sokhi, R.; Van Grieken, R. (2008). "Atmospheric polycyclic aromatic hydrocarbons: Source attribution, emission factors and regulation". Atmospheric Environment. 42 (13): 2895–2921. Bibcode:2008AtmEn..42.2895R. doi:10.1016/j.atmosenv.2007.12.010. hdl:2299/1986. ISSN 1352-2310. ^ Abdel-Shafy, Hussein I. (2016). "A review on polycyclic aromatic hydrocarbons: Source, environmental impact, effect on human health and remediation". Egyptian Journal of Petroleum. 25 (1): 107–123. doi:10.1016/j.ejpe.2015.03.011. ^ a b c d e f g h Ramesh, A.; Archibong, A.; Hood, D. B.; Guo, Z.; Loganathan, B. G. (2011). "Global environmental distribution and human health effects of polycyclic aromatic hydrocarbons". Global Contamination Trends of Persistent Organic Chemicals. Boca Raton, FL: CRC Press. pp. 97–126. ISBN 978-1-4398-3831-0. ^ a b Tobiszewski, M.; Namieśnik, J. (2012). "PAH diagnostic ratios for the identification of pollution emission sources". Environmental Pollution. 162: 110–119. doi:10.1016/j.envpol.2011.10.025. ISSN 0269-7491. PMID 22243855. ^ Walker, T. R.; MacAskill, D.; Rushton, T.; Thalheimer, A.; Weaver, P. (2013). "Monitoring effects of remediation on natural sediment recovery in Sydney Harbour, Nova Scotia". Environmental Monitoring and Assessment. 185 (10): 8089–107. doi:10.1007/s10661-013-3157-8. PMID 23512488. ^ Walker, T. R.; MacAskill, D.; Weaver, P. (2013). "Environmental recovery in Sydney Harbour, Nova Scotia: Evidence of natural and anthropogenic sediment capping". Marine Pollution Bulletin. 74 (1): 446–52. doi:10.1016/j.marpolbul.2013.06.013. PMID 23820194. ^ Walker, T. R.; MacAskill, N. D.; Thalheimer, A. H.; Zhao, L. (2017). "Contaminant mass flux and forensic assessment of polycyclic aromatic hydrocarbons: Tools to inform remediation decision making at a contaminated site in Canada". Remediation Journal. 27 (4): 9–17. doi:10.1002/rem.21525. ^ a b c Choi, H.; Harrison, R.; Komulainen, H.; Delgado Saborit, J. (2010). "Polycyclic aromatic hydrocarbons". WHO Guidelines for Indoor Air Quality: Selected Pollutants. Geneva: World Health Organization. ^ a b c Johnsen, Anders R.; Wick, Lukas Y.; Harms, Hauke (2005). "Principles of microbial PAH degradation in soil". Environmental Pollution. 133 (1): 71–84. doi:10.1016/j.envpol.2004.04.015. ISSN 0269-7491. PMID 15327858. ^ Mackay, D.; Callcott, D. (1998). "Partitioning and physical chemical properties of PAHs". In Neilson, A. (ed.). PAHs and Related Compounds. The Handbook of Environmental Chemistry. Springer Berlin Heidelberg. pp. 325–345. doi:10.1007/978-3-540-49697-7_8. ISBN 978-3-642-08286-3. ^ Atkinson, R.; Arey, J. (1994-10-01). "Atmospheric chemistry of gas-phase polycyclic aromatic hydrocarbons: formation of atmospheric mutagens". Environmental Health Perspectives. 102: 117–126. doi:10.2307/3431940. ISSN 0091-6765. JSTOR 3431940. PMC 1566940. PMID 7821285. ^ Srogi, K. (2007-11-01). "Monitoring of environmental exposure to polycyclic aromatic hydrocarbons: a review". Environmental Chemistry Letters. 5 (4): 169–195. doi:10.1007/s10311-007-0095-0. ISSN 1610-3661. PMC 5614912. PMID 29033701. ^ a b Haritash, A. K.; Kaushik, C. P. (2009). "Biodegradation aspects of polycyclic aromatic hydrocarbons (PAHs): A review". Journal of Hazardous Materials. 169 (1–3): 1–15. doi:10.1016/j.jhazmat.2009.03.137. ISSN 0304-3894. PMID 19442441. ^ a b c d Choi, H.; Harrison, R.; Komulainen, H.; Delgado Saborit, J. (2010). "Polycyclic aromatic hydrocarbons". WHO Guidelines for Indoor Air Quality: Selected Pollutants. Geneva: World Health Organization. ^ Kim, K.-H.; Jahan, S. A.; Kabir, E. (2011). "A review of diseases associated with household air pollution due to the use of biomass fuels". Journal of Hazardous Materials. 192 (2): 425–431. doi:10.1016/j.jhazmat.2011.05.087. ISSN 0304-3894. PMID 21705140. ^ Phillips, D. H. (1999). "Polycyclic aromatic hydrocarbons in the diet". Mutation Research/Genetic Toxicology and Environmental Mutagenesis. 443 (1–2): 139–147. doi:10.1016/S1383-5742(99)00016-2. ISSN 1383-5718. ^ a b Srogi, K. (2007). "Monitoring of environmental exposure to polycyclic aromatic hydrocarbons: a review". Environmental Chemistry Letters. 5 (4): 169–195. doi:10.1007/s10311-007-0095-0. ISSN 1610-3661. PMC 5614912. PMID 29033701. ^ a b Boffetta, P.; Jourenkova, N.; Gustavsson, P. (1997). "Cancer risk from occupational and environmental exposure to polycyclic aromatic hydrocarbons". Cancer Causes & Control. 8 (3): 444–472. doi:10.1023/A:1018465507029. ISSN 1573-7225. ^ a b Wagner, M.; Bolm-Audorff, U.; Hegewald, J.; Fishta, A.; Schlattmann, P.; Schmitt, J.; Seidler, A. (2015). "Occupational polycyclic aromatic hydrocarbon exposure and risk of larynx cancer: a systematic review and meta-analysis". Occupational and Environmental Medicine. 72 (3): 226–233. doi:10.1136/oemed-2014-102317. ISSN 1470-7926. PMID 25398415. Retrieved 2015-04-13. ^ a b c d e Hylland, K. (2006). "Polycyclic aromatic hydrocarbon (PAH) ecotoxicology in marine ecosystems". Journal of Toxicology and Environmental Health, Part A. 69 (1–2): 109–123. doi:10.1080/15287390500259327. ISSN 1528-7394. PMID 16291565. ^ Achten, C.; Hofmann, T. (2009). "Native polycyclic aromatic hydrocarbons (PAH) in coals – A hardly recognized source of environmental contamination". Science of the Total Environment. 407 (8): 2461–2473. Bibcode:2009ScTEn.407.2461A. doi:10.1016/j.scitotenv.2008.12.008. ISSN 0048-9697. PMID 19195680. ^ Jørgensen, A.; Giessing, A. M. B.; Rasmussen, L. J.; Andersen, O. (2008). "Biotransformation of polycyclic aromatic hydrocarbons in marine polychaetes". Marine Environmental Research. 65 (2): 171–186. doi:10.1016/j.marenvres.2007.10.001. ISSN 0141-1136. PMID 18023473. ^ a b Johnsen, A. R.; Wick, L. Y.; Harms, H. (2005). "Principles of microbial PAH-degradation in soil". Environmental Pollution. 133 (1): 71–84. doi:10.1016/j.envpol.2004.04.015. ISSN 0269-7491. PMID 15327858. ^ Lundstedt, S.; White, P. A.; Lemieux, C. L.; Lynes, K. D.; Lambert, I. B.; Öberg, L.; Haglund, P.; Tysklind, M. (2007). "Sources, fate, and toxic hazards of oxygenated polycyclic aromatic hydrocarbons (PAHs) at PAH- contaminated sites". AMBIO: A Journal of the Human Environment. 36 (6): 475–485. doi:10.1579/0044-7447(2007)36[475:SFATHO]2.0.CO;2. ISSN 0044-7447. ^ Fu, P. P.; Xia, Q.; Sun, X.; Yu, H. (2012). "Phototoxicity and Environmental Transformation of Polycyclic Aromatic Hydrocarbons (PAHs)—Light-Induced Reactive Oxygen Species, Lipid Peroxidation, and DNA Damage". Journal of Environmental Science and Health, Part C. 30 (1): 1–41. doi:10.1080/10590501.2012.653887. ISSN 1059-0501. PMID 22458855. ^ a b c Vane, Christopher H.; Kim, Alexander W.; Beriro, Darren J.; Cave, Mark R.; Knights, Katherine; Moss-Hayes, Vicky; Nathanail, Paul C. (2014). "Polycyclic aromatic hydrocarbons (PAH) and polychlorinated biphenyls (PCB) in urban soils of Greater London, UK". Applied Geochemistry. 51: 303–314. Bibcode:2014ApGC...51..303V. doi:10.1016/j.apgeochem.2014.09.013. ISSN 0883-2927. ^ Cave, Mark R.; Wragg, Joanna; Harrison, Ian; Vane, Christopher H.; Van de Wiele, Tom; De Groeve, Eva; Nathanail, C. Paul; Ashmore, Matthew; Thomas, Russell; Robinson, Jamie; Daly, Paddy (2010). "Comparison of Batch Mode and Dynamic Physiologically Based Bioaccessibility Tests for PAHs in Soil Samples" (PDF). Environmental Science & Technology. 44 (7): 2654–2660. Bibcode:2010EnST...44.2654C. doi:10.1021/es903258v. ISSN 0013-936X. PMID 20201516. ^ a b c Vane, Christopher H.; Rawlins, Barry G.; Kim, Alexander W.; Moss-Hayes, Vicky; Kendrick, Christopher P.; Leng, Melanie J. (2013). "Sedimentary transport and fate of polycyclic aromatic hydrocarbons (PAH) from managed burning of moorland vegetation on a blanket peat, South Yorkshire, UK". Science of the Total Environment. 449: 81–94. Bibcode:2013ScTEn.449...81V. doi:10.1016/j.scitotenv.2013.01.043. ISSN 0048-9697. PMID 23416203. ^ Vane, C. H.; Harrison, I.; Kim, A. W.; Moss-Hayes, V.; Vickers, B.P. ; Horton, B. P. (2008). "Status of organic pollutants in surface sediments of Barnegat Bay-Little Egg Harbor Estuary, New Jersey, USA" (PDF). Marine Pollution Bulletin. 56 (10): 1802–1808. doi:10.1016/j.marpolbul.2008.07.004. ISSN 0025-326X. PMID 18715597. ^ a b c Vane, C. H.; Chenery, S. R.; Harrison, I.; Kim, A. W.; Moss-Hayes, V.; Jones, D. G. (2011). "Chemical signatures of the Anthropocene in the Clyde estuary, UK: sediment-hosted Pb, 207/206Pb, total petroleum hydrocarbon, polyaromatic hydrocarbon and polychlorinated biphenyl pollution records". Philosophical Transactions of the Royal Society A: Mathematical, Physical and Engineering Sciences. 369 (1938): 1085–1111. Bibcode:2011RSPTA.369.1085V. doi:10.1098/rsta.2010.0298. ISSN 1364-503X. PMID 21282161. ^ Vane, Christopher H.; Beriro, Darren J.; Turner, Grenville H. (2015). "Rise and fall of mercury (Hg) pollution in sediment cores of the Thames Estuary, London, UK". Earth and Environmental Science Transactions of the Royal Society of Edinburgh. 105 (4): 285–296. doi:10.1017/S1755691015000158. ISSN 1755-6910. ^ Langston, W. J.; O’Hara, S.; Pope, N. D.; Davey, M.; Shortridge, E.; Imamura, M.; Harino, H.; Kim, A.; Vane, C. H. (2011). "Bioaccumulation surveillance in Milford Haven Waterway" (PDF). Environmental Monitoring and Assessment. 184 (1): 289–311. doi:10.1007/s10661-011-1968-z. ISSN 0167-6369. PMID 21432028. ^ a b Vane, C.; Harrison, I.; Kim, A. (2007). "Polycyclic aromatic hydrocarbons (PAHs) and polychlorinated biphenyls (PCBs) in sediments from the Mersey Estuary, U.K" (PDF). Science of the Total Environment. 374 (1): 112–126. Bibcode:2007ScTEn.374..112V. doi:10.1016/j.scitotenv.2006.12.036. ISSN 0048-9697. PMID 17258286. ^ Vane, C. H.; Harrison, I.; Kim, A. W.; Moss-Hayes, V.; Vickers, B. P.; Hong, K. (2009). "Organic and metal contamination in surface mangrove sediments of South China" (PDF). Marine Pollution Bulletin. 58 (1): 134–144. doi:10.1016/j.marpolbul.2008.09.024. ISSN 0025-326X. PMID 18990413. ^ Meyers, P. A.; Ishiwatari, R. (1993). "Lacustrine organic geochemistry—an overview of indicators of organic matter sources and diagenesis in lake sediments". Organic Geochemistry. 20 (7): 867–900. doi:10.1016/0146-6380(93)90100-P. ISSN 0146-6380. Retrieved 2015-02-04. ^ Silliman, J. E.; Meyers, P. A.; Eadie, B. J.; Val Klump, J. (2001). "A hypothesis for the origin of perylene based on its low abundance in sediments of Green Bay, Wisconsin". Chemical Geology. 177 (3–4): 309–322. Bibcode:2001ChGeo.177..309S. doi:10.1016/S0009-2541(00)00415-0. ISSN 0009-2541. ^ Wakeham, S. G.; Schaffner, C.; Giger, W. (1980). "Poly cyclic aromatic hydrocarbons in Recent lake sediments—II. Compounds derived from biogenic precursors during early diagenesis". Geochimica et Cosmochimica Acta. 44 (3): 415–429. Bibcode:1980GeCoA..44..415W. doi:10.1016/0016-7037(80)90041-1. ISSN 0016-7037. Retrieved 2015-02-04. ^ a b c Bostrom, C.-E.; Gerde, P.; Hanberg, A.; Jernstrom, B.; Johansson, C.; Kyrklund, T.; Rannug, A.; Tornqvist, M.; Victorin, K.; Westerholm, R. (2002). "Cancer risk assessment, indicators, and guidelines for polycyclic aromatic hydrocarbons in the ambient air". Environmental Health Perspectives. 110 (Suppl. 3): 451–488. doi:10.1289/ehp.02110s3451. ISSN 0091-6765. PMC 1241197. PMID 12060843. ^ Loeb, L. A.; Harris, C. C. (2008). "Advances in Chemical Carcinogenesis: A Historical Review and Prospective". Cancer Research. 68 (17): 6863–6872. doi:10.1158/0008-5472.CAN-08-2852. ISSN 0008-5472. PMC 2583449. PMID 18757397. ^ a b c d e Dipple, A. (1985). "Polycyclic Aromatic Hydrocarbon Carcinogenesis". Polycyclic Hydrocarbons and Carcinogenesis. ACS Symposium Series. 283. American Chemical Society. pp. 1–17. doi:10.1021/bk-1985-0283.ch001. ISBN 978-0-8412-0924-4. ^ International Agency for Research on Cancer (1984). Polynuclear Aromatic Compounds, Part 3, Industrial Exposures in Aluminium Production, Coal Gasification, Coke Production, and Iron and Steel Founding (Report). IARC Monographs on the Evaluation of Carcinogenic Risks to Humans. Lyon, France: World Health Organization. pp. 89–92, 118–124. Retrieved 2016-02-13. ^ a b c Baird, W. M.; Hooven, L. A.; Mahadevan, B. (2015-02-01). "Carcinogenic polycyclic aromatic hydrocarbon-DNA adducts and mechanism of action". Environmental and Molecular Mutagenesis. 45 (2–3): 106–114. doi:10.1002/em.20095. ISSN 1098-2280. PMID 15688365. ^ Slaga, T. J. (1984). "Chapter 7: Multistage skin carcinogenesis: A useful model for the study of the chemoprevention of cancer". Acta Pharmacologica et Toxicologica. 55 (S2): 107–124. doi:10.1111/j.1600-0773.1984.tb02485.x. ISSN 1600-0773. ^ a b c Xue, W.; Warshawsky, D. (2005). "Metabolic activation of polycyclic and heterocyclic aromatic hydrocarbons and DNA damage: A review". Toxicology and Applied Pharmacology. 206 (1): 73–93. doi:10.1016/j.taap.2004.11.006. ISSN 0041-008X. PMID 15963346. ^ Shimada, T.; Fujii-Kuriyama, Y. (2004-01-01). "Metabolic activation of polycyclic aromatic hydrocarbons to carcinogens by cytochromes P450 1A1 and 1B1". Cancer Science. 95 (1): 1–6. doi:10.1111/j.1349-7006.2004.tb03162.x. ISSN 1349-7006. PMID 14720319. ^ Androutsopoulos, V. P.; Tsatsakis, A. M.; Spandidos, D. A. (2009). "Cytochrome P450 CYP1A1: wider roles in cancer progression and prevention". BMC Cancer. 9 (1): 187. doi:10.1186/1471-2407-9-187. ISSN 1471-2407. PMC 2703651. PMID 19531241. ^ a b Henkler, F.; Stolpmann, K.; Luch, Andreas (2012). "Exposure to Polycyclic Aromatic Hydrocarbons: Bulky DNA Adducts and Cellular Responses". In Luch, A. (ed.). Molecular, Clinical and Environmental Toxicology. Experientia. Supplementum. Experientia Supplementum. 101. Springer Basel. pp. 107–131. doi:10.1007/978-3-7643-8340-4_5. ISBN 978-3-7643-8340-4. PMID 22945568. ^ a b c Nebert, D. W.; Dalton, T. P.; Okey, A. B.; Gonzalez, F. J. (2004). "Role of Aryl Hydrocarbon Receptor-mediated Induction of the CYP1 Enzymes in Environmental Toxicity and Cancer". Journal of Biological Chemistry. 279 (23): 23847–23850. doi:10.1074/jbc.R400004200. ISSN 1083-351X. PMID 15028720. ^ a b Ramesh, A.; Walker, S. A.; Hood, D. B.; Guillén, M. D.; Schneider, K.; Weyand, E. H. (2004). "Bioavailability and risk assessment of orally ingested polycyclic aromatic hydrocarbons". International Journal of Toxicology. 23 (5): 301–333. doi:10.1080/10915810490517063. ISSN 1092-874X. PMID 15513831. Retrieved 2015-04-13. ^ Korashy, H. M.; El-Kadi, A. O. S. (2006). "The Role of Aryl Hydrocarbon Receptor in the Pathogenesis of Cardiovascular Diseases". Drug Metabolism Reviews. 38 (3): 411–450. doi:10.1080/03602530600632063. ISSN 0360-2532. PMID 16877260. ^ a b Lewtas, J. (2007). "Air pollution combustion emissions: Characterization of causative agents and mechanisms associated with cancer, reproductive, and cardiovascular effects". Mutation Research/Reviews in Mutation Research. The Sources and Potential Hazards of Mutagens in Complex Environmental Matrices – Part II. 636 (1–3): 95–133. doi:10.1016/j.mrrev.2007.08.003. ISSN 1383-5742. PMID 17951105. ^ a b c d Ramos, Kenneth S.; Moorthy, Bhagavatula (2005). "Bioactivation of Polycyclic Aromatic Hydrocarbon Carcinogens within the vascular Wall: Implications for Human Atherogenesis". Drug Metabolism Reviews. 37 (4): 595–610. doi:10.1080/03602530500251253. ISSN 0360-2532. PMID 16393887. ^ Kunzli, N.; Tager, I. (2005). "Air pollution: from lung to heart" (PDF). Swiss Medical Weekly. 135 (47–48): 697–702. PMID 16511705. Retrieved 2015-12-16. ^ Ridker, P. M. (2009). "C-Reactive Protein: Eighty Years from Discovery to Emergence as a Major Risk Marker for Cardiovascular Disease". Clinical Chemistry. 55 (2): 209–215. doi:10.1373/clinchem.2008.119214. ISSN 1530-8561. PMID 19095723. ^ Rossner, P., Jr.; Sram, R. J. (2012). "Immunochemical detection of oxidatively damaged DNA". Free Radical Research. 46 (4): 492–522. doi:10.3109/10715762.2011.632415. ISSN 1071-5762. PMID 22034834. ^ Sram, R. J.; Binkova, B.; Dejmek, J.; Bobak, M. (2005). "Ambient Air Pollution and Pregnancy Outcomes: A Review of the Literature". Environmental Health Perspectives. 113 (4): 375–382. doi:10.1289/ehp.6362. ISSN 0091-6765. PMC 1278474. PMID 15811825. ^ Winans, B.; Humble, M.; Lawrence, B. P. (2011). "Environmental toxicants and the developing immune system: A missing link in the global battle against infectious disease?". Reproductive Toxicology. 31 (3): 327–336. doi:10.1016/j.reprotox.2010.09.004. PMC 3033466. PMID 20851760. ^ Wormley, D. D.; Ramesh, A.; Hood, D. B. (2004). "Environmental contaminant–mixture effects on CNS development, plasticity, and behavior". Toxicology and Applied Pharmacology. 197 (1): 49–65. doi:10.1016/j.taap.2004.01.016. ISSN 0041-008X. PMID 15126074. ^ Suades-González, E.; Gascon, M.; Guxens, M.; Sunyer, J. (2015). "Air Pollution and Neuropsychological Development: A Review of the Latest Evidence". Endocrinology. 156 (10): 3473–3482. doi:10.1210/en.2015-1403. ISSN 0013-7227. PMC 4588818. PMID 26241071. ^ Kim, Ki-hyun; Jahan, Shamin Ara; Kabir, Ehsanul; Brown, Richard J. C. (October 2013). "A review of airborne polycyclic aromatic hydrocarbons (PAHs) and their human health effects". Environment International. 60: 71–80. doi:10.1016/j.envint.2013.07.019. ISSN 0160-4120. PMID 24013021. ^ Keith, Lawrence H. (2014-12-08). "The Source of U.S. EPA's Sixteen PAH Priority Pollutants". Polycyclic Aromatic Compounds. 0 (2–4): 147–160. doi:10.1080/10406638.2014.892886. ISSN 1040-6638. ^ Agency for Toxic Substances and Disease Registry (ATSDR) (1995). Toxicological profile for Polycyclic Aromatic Hydrocarbons (PAHs) (Report). Atlanta, GA: U.S. Department of Health and Human Services, Public Health Service. Retrieved 2015-05-06. ^ a b EFSA Panel on Contaminants in the Food Chain (CONTAM) (2008). Polycyclic Aromatic Hydrocarbons in Food: Scientific Opinion of the Panel on Contaminants in the Food Chain (Report). Parma, Italy: European Food Safety Authority (EFSA). pp. 1–4. ^ Carey, Bjorn (2005-10-18). "Life's Building Blocks 'Abundant in Space'". Space.com. Retrieved 2014-03-03. ^ Hudgins, D. M.; Bauschlicher, C. W., Jr; Allamandola, L. J. (2005). "Variations in the Peak Position of the 6.2 μm Interstellar Emission Feature: A Tracer of N in the Interstellar Polycyclic Aromatic Hydrocarbon Population". Astrophysical Journal. 632 (1): 316–332. Bibcode:2005ApJ...632..316H. CiteSeerX 10.1.1.218.8786. doi:10.1086/432495. Retrieved 2014-03-03. ^ Clavin, Whitney (2015-02-10). "Why Comets Are Like Deep Fried Ice Cream". NASA. Retrieved 2015-02-10. ^ a b Battersby, S. (2004). "Space molecules point to organic origins". New Scientist. Retrieved 2009-12-11. ^ a b Mulas, G.; Malloci, G.; Joblin, C.; Toublanc, D. (2006). "Estimated IR and phosphorescence emission fluxes for specific polycyclic aromatic hydrocarbons in the Red Rectangle". Astronomy and Astrophysics. 446 (2): 537–549. arXiv:astro-ph/0509586. Bibcode:2006A&A...446..537M. doi:10.1051/0004-6361:20053738. ^ Staff (2010-07-28). "Bright Lights, Green City". NASA. Retrieved 2014-06-13. ^ García Hernández, D. A.; Manchado, A.; García Lario, P.; Stanghellini, L.; et al. (2010). "Formation Of Fullerenes In H-Containing Planetary Nebulae". The Astrophysical Journal Letters. 724 (1): L39–L43. arXiv:1009.4357. Bibcode:2010ApJ...724L..39G. doi:10.1088/2041-8205/724/1/L39. ^ Atkinson, N. (2010-10-27). "Buckyballs Could Be Plentiful in the Universe". Universe Today. Retrieved 2010-10-28. ^ a b Staff (2012-09-20). "NASA Cooks Up Icy Organics to Mimic Life's Origins". Space.com. Retrieved 2012-09-22. ^ a b Gudipati, M. S.; Yang, R. (2012). "In-Situ Probing Of Radiation-Induced Processing Of Organics In Astrophysical Ice Analogs—Novel Laser Desorption Laser Ionization Time-Of-Flight Mass Spectroscopic Studies" (PDF). The Astrophysical Journal Letters. 756 (1): L24. Bibcode:2012ApJ...756L..24G. doi:10.1088/2041-8205/756/1/L24. ^ Robert Hurt (2005-06-27). "Understanding Polycyclic Aromatic Hydrocarbons". Spitzer Space Telescope. Retrieved 2018-04-21. ^ López Puertas, Manuel (2013-06-06). "PAHs in Titan's Upper Atmosphere". CSIC. Retrieved 2013-06-06. ^ Staff (11 October 2018). ""A Prebiotic Earth" – Missing Link Found on Saturn's Moon Titan". DailyGalaxy.com. Retrieved 11 October 2018. ^ Zhao, Long; et al. (8 October 2018). "Low-temperature formation of polycyclic aromatic hydrocarbons in Titan's atmosphere". Nature Astronomy. 2 (12): 973–979. doi:10.1038/s41550-018-0585-y. 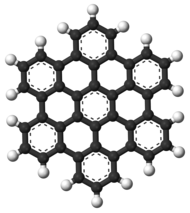 Wikimedia Commons has media related to Polycyclic aromatic hydrocarbons. Polycyclic Aromatic Hydrocarbons (PAHs)--EPA Fact Sheet. U.S. Environmental Protection Agency, Office of Solid Waste, January 2008.